If you were born in the '80s, '90s or early 2000s, you probably can't remember a time without a smartphone or computer. There's also a chance you might see Google, Apple or Amazon as the ultimate employer. That's the finding from career data site Comparably. The site surveyed 23,000 employees between the ages of 18 to 35 on their dream workplace. The resulting lists were nearly identical, naming top tech companies such as Google, Amazon, Microsoft, Uber and Facebook. The lists can be key for young job seekers trying to think strategically about their careers. While very similar, the lists had one key difference. 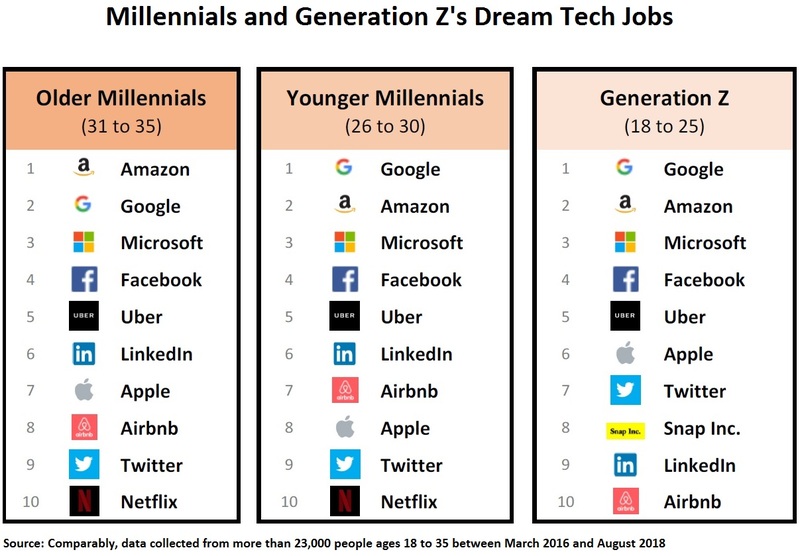 Those ages 18 to 25 chose Snap Inc as a top company. Their older counterparts, ages 26 to 34, chose Netflix instead. Lifestyle could be a factor, according to Comparably CEO Jason Nazar. Since Snapchat launched six years ago, the platform has become a primary means of communication for Gen Z. "They also see their parents on social networks such as Facebook and that's not where they want to be," he adds. Nazar says, "They live in this product day to day, it's a natural reaction to say that's where they want to work." Comparably notes that while Millennials and Gen Z are often grouped together, their lifestyles vary widely. An older Millennial of 34 is more likely to have a family and be established in their career where a 21-year-old member of Gen Z is just entering the workforce. Despite these differences, they all value the same top names. With so many young people targeting the same companies, the real lesson for jobseekers is the competition they'll be facing. After all, tech companies are famously selective as it is. Some estimate applicants at Google have only a .2 percent chance of getting hired. To stand out, gen z should keep in mind a few important factors, says Nazar. Large companies aren't just looking for high IQs and Ivy League degrees. They're also looking for candidates with high emotional intelligence (EQ) and relevant experience. He suggests that younger workers should worry less about breaking into big name companies and more about building a skillset that helps them stand apart. Think strategically, Nazar says. "Go somewhere where you can take on more responsibility and build relationships with senior folks more easily and organically," he continues. "The big names will turn down a candidate," who only looks good on paper, he says. "Show that you're a positive person who wants to be coached and has the ability to impact their environment."